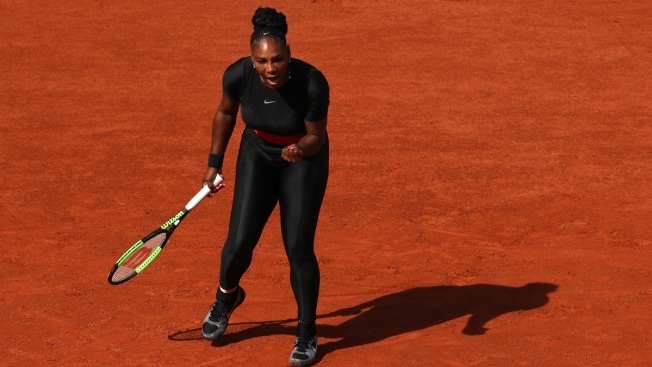 Serena Williams of The United States celebrates during her ladies singles first round match against Kristyna Pliskova of Czech Republic during day three of the 2018 French Open at Roland Garros on May 29, 2018, in Paris, France. The fashion statement, this time in the form of a black bodysuit with a red belt that she said made her feel like a "warrior princess." The cries of "Come on!" The big serves that provided 13 aces. The returns that eventually produced three consecutive breaks of serve. "Well, my priority is Olympia. No matter what, that's my priority. 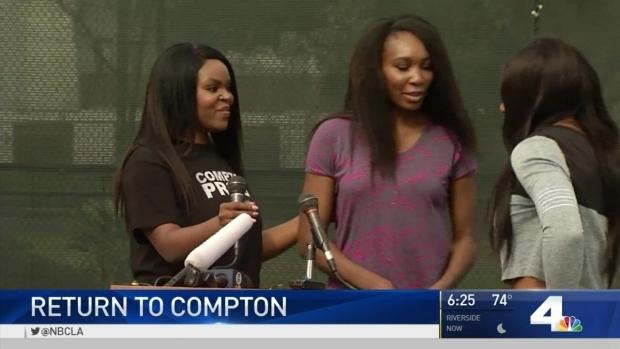 I have given tennis so much, and tennis has actually given me a lot, and I couldn't be more grateful," Williams said. "She's my priority, and I work everything around her." The 36-year-old American had not played in one of tennis's biggest tournaments since winning the Australian Open in January 2017 for her 23rd Grand Slam title, breaking a tie with Steffi Graf for the most in the professional era. "Just literally not sure if I was going to make it or not at several different times," Williams said. "A lot of people have really reached out, because they have so many similar stories, too. I feel like a lot of people don't talk about it. They talk about the baby and how happy they are. But it's a lot that goes into it with the pregnancy and with giving birth, and it's called a 'miracle' for a reason." "She's a genuine champion," Barty said. "What she's done to be able to get back ... is a pretty amazing thing." Tuesday's return was striking, from Williams' powerful shots to her outfit, which called to mind the "catsuit" she wore at the 2002 U.S. Open. All eyes were on Williams, though. On the fifth point, she delivered an ace at 112 mph (181 kph). Moments later, the chair umpire intoned, "Jeu, Madame Williams," — French for "Game, Mrs. Williams," a change from the "Mademoiselle" used for unmarried female players. Pliskova, a lefty whose twin sister upset Williams in the 2016 U.S. Open semifinals, actually hit more aces, 15. That's the most anyone has hit against Williams since at least 2008, according to the WTA. Indeed, Williams appeared to have trouble reading Pliskova's serves early on. There were other blips, of the sort to be expected from someone who hasn't played lately. Williams double-faulted seven times. She had nearly as many unforced errors, 25, as winners, 29. All was not perfect, of course. In the final game, Williams' right foot gave way as she sprinted toward the net and she landed on her backside. At least she was able to laugh at that as she went to the sideline to towel off. A spectator yelled: "That's all right, Serena! You still look great!" After months of worrying more about diapers than drop shots, of breastfeeding for what she called "a really, really, really long time," of organizing her practice schedule around her newborn's nap schedule, Williams was back to doing what she's most famous for, in an arena where she earned trophies in 2002, 2013 and 2015. "I don't want her to ever feel like I'm not around. I'm a super hands-on mom," Williams said. "Maybe too much." "I'm definitely here to compete and do the best that I can do, obviously. I'm not putting any pressure on myself as I normally do," Williams began. Then, perhaps questioning her own words as she heard them, she paused, before adding with a laugh: "I think deep down, we all know the answer to that."